I’ve been quilting off and on for about 18 years in between having a family and starting my online fabric business. However, I discovered the modern quilting movement about a year ago and have been simply smitten with this style of quilting! I quilt for a several reasons – First, for the sheer pleasure of it. Second, I’ll be honest here, it sure does make me feel good to share my work with others and get a pat on the back for it. Third, I also quilt for business. Over the years I’ve sold commissioned quilts, taught quilting classes, machine quilted for others, and now I love making kit samples. The latest venture for me is designing my own original quilt patterns. I love it because there are just so many design possibilities to explore! My favorite quilting tip is more of a suggestion – try to quilt at least one quilt yourself before you decide on sending it off to someone else. There’s nothing wrong with hiring a quilter of course, but the satisfaction you get from making it your own is truly rewarding! And you never know – you just may discover, like I did, that machine quilting is your favorite part of making a quilt! 4. What was your inspiration for you Quilt Festival quilt (above)? My festival quilt, Charming Chevrons, was made for one of the quilt alongs I host on my blog. It was my first real modern quilt and my first quilt made completely from solids. I learned how well quilting shows on solid fabrics, so they’ve now become a favorite of mine! Charming Chevrons also hung at QuiltCon which was a huge step for me to enter something in a national show. No – I stick to strictly 2-dimensional “flat” sewing rather than making 3-D items. When I first heard of modern sewing I thought it was all about making cute kids’ clothes, tote bags and adorable accessories which I just couldn’t get the hang of – there were simply too many little trinkets to fuss with, LOL! However, once I discovered that modern sewists were quilters, too, I was ready to jump on the modern bandwagon! As I hinted at above, I am enjoying designing original (mostly modern) quilts and love to share them with others on my blog. You can see all of my quilt alongs at ChristasQuiltAlong.com. My current quilt along, String of Pearls (above), recently launched and it features Pearl Bracelets with solids. My very first quilt pattern debut will be featured in an upcoming issue of Quilty magazine later this year, and I hope to eventually publish more and write a book on quilting, too. The success of other bloggers I follow (like you Amy!) has really encouraged me to give it a try! Thanks for sharing Christa! 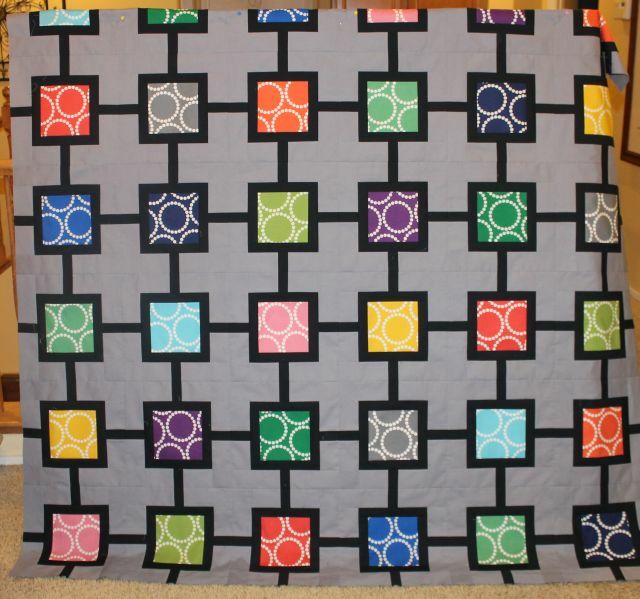 I’m so glad that you have found modern quilting – and the community! I’m always inspired by Christa’s quilting.